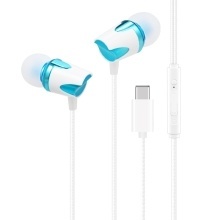 The earphones adopt Type-C port design, suitable for Type-C port mobile phones. Its ergonomic design and combine with silicone earbuds enhances earphones&apos; skid resistance. High-quality in-line microphone and control buttons make it easier to operate phone calls, music and volume. The headphones with metal head shows good quality and exquisite appearance, also provide clear sound. Type-C headphones is suitable for Type-C port mobile phones such as, for MI 6 / Note 3 / MIX 2 and for LE 2 / 3 Series. High-quality in-line microphone and control buttons allow seamless operation of phone calls, music and volume. The headphone provides natural clear and high-quality sound, make you enjoy music at any time. The earbuds adopt metal material, offering elegant and fashionable appearance. Ergonomic design, comfortable to wear. And with super toughness wire made of TPE material, durable to use.